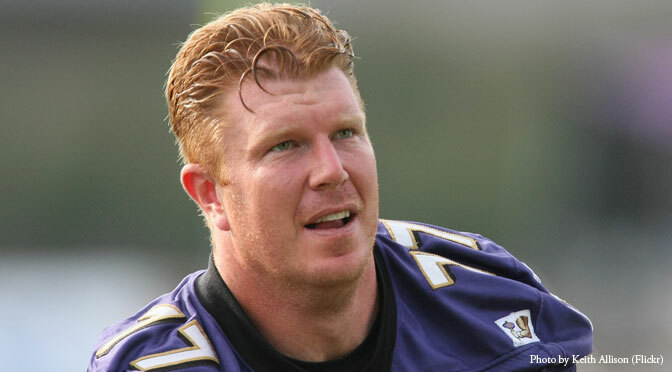 According to a March For Life press release, retired NFL star and pro-life champion Matt Birk will speak at the upcoming March for Life Rally on the National Mall and keynote the 34th Annual Rose Dinner on January 22, 2016. Birk played 15 seasons in the NFL with the Minnesota Vikings and Baltimore Ravens. A six-time Pro Bowl selection, Birk finished his illustrious career with a win in Super Bowl XLVII over the San Francisco 49ers. Planned Parenthood performs about 330,000 abortions a year. I am Catholic, I am active in the pro-life movement and I just felt like I couldn’t deal with that. I couldn’t endorse that in any way. In addition to his work as a pro-life activist, Birk is the founder of the HIKE Foundation, whose goal is “to provide at-risk children with the educational opportunities needed to excel in the classroom and in life.” For his work with at-risk youth, as well as his success on the football field, Birk was the recipient of the 2011 Walter Payton Man of the Year Award.